With a boost from Democratic Party officials, the senator is formally approved for the first primary ballot. 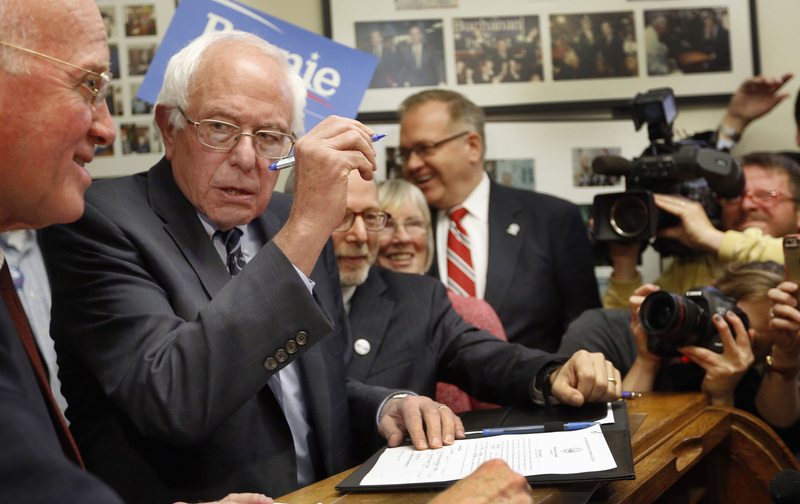 It’s official, Bernie Sanders is sufficiently Democratic to run as a Democrat. For the purposes of the New Hampshire presidential primary, and presumably for the 2016 primaries and caucuses to follow, the veteran independent from Vermont has been approved to appear on the party ballot. Sanders has, of course, been campaigning as a Democrat since April. But the validation of his Democratic status by New Hampshire election officials—though hardly a surprise—is significant in a country where the arcane rules of different states can sometimes serve as barriers to contenders who seek to enter Democratic or Republican primaries. N.H. Democratic Party chair Ray Buckley argued for accepting longtime independent Bernie Sanders as a Democrat. Sanders ran and won his races for mayor of Burlington, Vermont, for the US House and for the US Senate as an independent. And though he has caucused with Democrats in the House and Senate since arriving in Washington in 1991, he has always identified as an “I” rather than a “D.” Even as he began to ponder a president run, the senator weighed whether to campaign as an independent or a Democrat. Sanders finally decided to enter the competition as a Democrat, after explaining that he would not risk “spoiling” a November race and handing the presidency to a conservative Republican. The decision by the democratic socialist senator from Vermont to enter the 2016 Democratic primaries and caucuses was quickly accepted by the Democratic National Committee, which has featured the senator from Vermont on its website and included him in debates with Clinton and former Maryland governor Martin O’Malley. Sanders has also been accepted by a good many grassroots Democrats. The latest CBS/YouGov poll of likely New Hampshire primary voters gives the senator 52 percent support, with 45 percent for Clinton and 3 percent for O’Malley. But the question of whether someone who has historically identified as an independent—and who has run against and defeated Democrats and Republicans—could suddenly become a Democratic presidential contender was raised after Sanders filed his paperwork to run in the New Hampshire primary. Under state law, candidates are required to declare themselves to be members of a party in order to appear on its primary ballot. A New Hampshire conservative who is well-known for his harsh criticisms of President Obama, Andy Martin, argued that Sanders’s self-identification on his US Senate’s website as an independent made him ineligible to declare himself a Democrat in New Hampshire. Andru Volinsky, the New Hampshire counsel to the Sanders campaign, countered with documents showing Sanders had filed paperwork with the Federal Election Commission to run as a Democrat, and that the DNC and the Democratic parties in both New Hampshire and Vermont had accepted the senator’s candidacy. “There is plenty of documentary evidence establishing that at the time of his filing, which is the relevant time, Bernie Sanders was and is, and remains and will be, affiliated with the Democratic party,” argued Volinsky. On Tuesday, the state’s Ballot Law Commission had to resolve the issue. There was some discussion. Commission chair Brad Cook said he thought that the Vermonter’s identification as an independent senator raised questions. But New Hampshire Democratic Party chair Ray Buckley, who attended the commission meeting, argued as he has for months that Sanders should be on the party’s primary ballot.